Kid crafts are in full effect over here. My three year old is a confetti factory, busily whiling away a good 40 minutes just cutting little chunks of paper and littering them all over the house. Her other favorite activity is folding paper into mishapen lumps, and wrapping them in yards of tape. She then presents them to me as a gift with such tender sincerity, that I couldn’t possibly be mad that she literally used almost all the tape. My eldest is having an ornament exchange at school, so she came up with this idea, which I thought I’d share. She rummaged through my things and found this little bird, and asked to needlefelt a nest for it, and then found little treasures to tuck in with it. 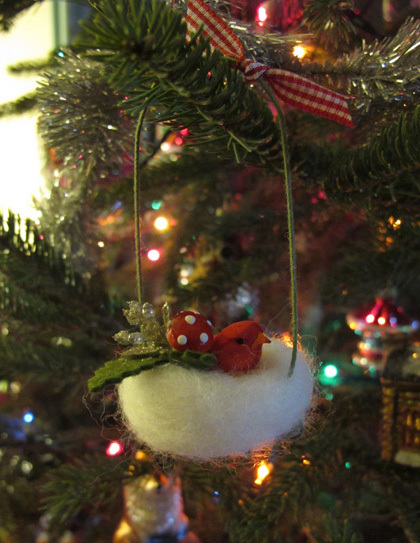 Then I just poked some wire through the nest to hang it and voila! I thought it was pretty snappy. :) So simple and cute! 2 Responses to glad tidings! Lovely bird in nest. What a lucky classmate who will receive it! December greetings from Vancouver, BC! Love the nest!! It is beautiful. What a creative little girl.